Dash of Green: Belated Halloween Post! Wow, it's already November 3rd, and I haven't written since before that most "hallowed" of holidays (ha). How was everybody's Halloween this year? I must say, ours was a lot more mellow this year. It was a drizzly day, William napped late (and me with him!) and we weren't able to get our act together as a family this year because of a moody baby and computer-bound Dash. Last year, we all went as Totoros, which was awesome!! Dash and I were 大トトロ, Ella was a 中トトロ, and little William was a ちびトトロ. I made the outfits using thrift shop finds with a little bit of sewing, and we were all nice and comfy warm in the wet NW October weather. Anyway, so that was last year. 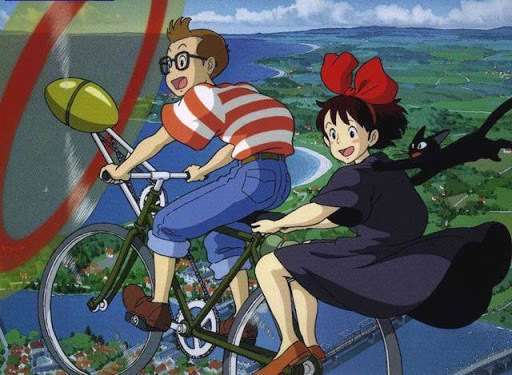 This year, the Dashiells planned on going as the cast to another Ghibli film: Kiki's Delivery Service! 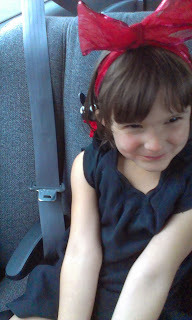 Ella Rose is such a natural Kiki! 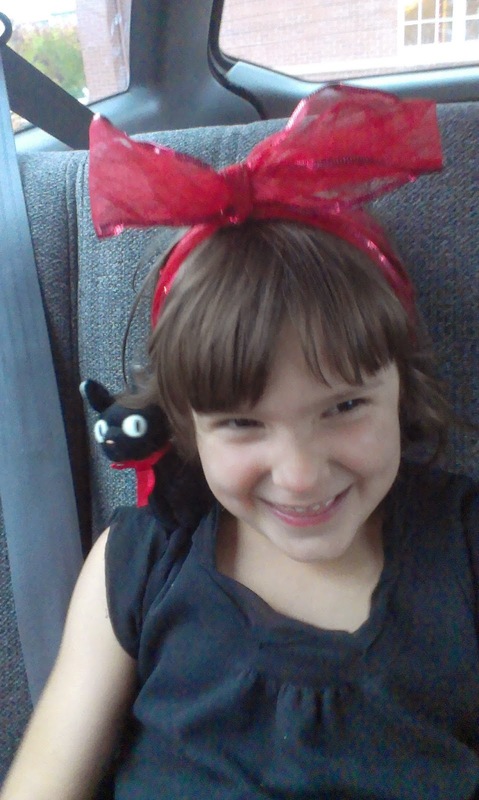 Kiki's a friendly witch who makes deliveries on her broom! Unfortunately, I have zippo snapshots of her with her broom, but I assure you it was the perfect prop for her. Love the Jiji plushie too, eh? Oh, my god! First animated gif on my blog ever!!!! That's right, he played a fluffy female cat -- the "love interest" of Jiji. 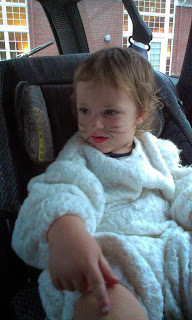 His costume was just a lamb costume with "cat" face paint on. Ha! My character, Ursula, his plain as plain can be so I don't think many people thought I was dressed up at all. Two animated gifs in one post! What?? Ursula's an artist that Kiki meets, so that it was pretty fitting of me to be her for Halloween. Plus, I've got the ponytail hair and her outfit in my closet already - ha!! To make some attempt at looking dressed up, I stuck a couple paintbrushes in my ponytail. Besides that, I just looked like somebody poorly dressed for the weather. All in all, it was fun pretending to be the characters and throwing quotes around to one another...but exactly 0 people recognized who we were, or even knew the movie. HA!! I swear Dash is such a natural Tombo! The glasses, short hair, goofy smile, and even the outfit is something he could've pulled outta his closet! And, most important of all, something warm!!!! Well, with that I bid you adieu. Hope you all are looking forward to November -- I know I am!! -- and until next time take care and Happy Belated Halloween Posts! !